They didn't last very long ... again. Liam Hendriks gave up a two-run homer to Aaron Judge on his ninth pitch and the A's never recovered, making another early playoff exit with a 7-2 loss to the New York Yankees in the American League wild-card game Wednesday night. 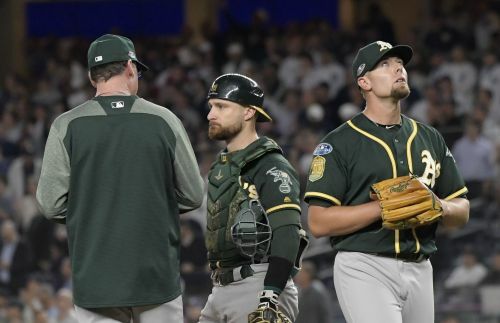 Oakland's dangerous bats were mostly silenced by Luis Severino and a nasty New York bullpen, sending the A's right back across the country and home for the winter — an abrupt ending to their surprisingly successful 97-win season. "Unless you play the last game, it's disappointing," manager Bob Melvin said. "So I think when you reflect back and look where we started the year, kind of where we came from, it ends up being a good year. But it doesn't feel good right now." It was the eighth consecutive defeat for the A's in a winner-take-all postseason game since Reggie Jackson's homer helped beat a New York Mets team that featured Tom Seaver and Willie Mays in Game 7 of the 1973 World Series. "We've had a tough time with it," Melvin said. "And it's frustrating." Three of those setbacks have come courtesy of the Yankees, including five-game Division Series losses in 2000 and 2001. New York also swept the A's 3-0 in the 1981 ALCS. With his rotation heavily depleted by injuries, Melvin started Hendriks in a "bullpen game," a strategic trend that's quickly catching on around the majors after an innovative Tampa Bay organization employed it often this year with tangible success. Hendriks, a no-name reliever with starting experience, returned from the minors in September and was effective in eight games as an "opener." He tossed seven shutout innings over the last seven, pitching one inning each time before handing the ball to someone else as the Athletics relied on a strong and deep bullpen. That was the idea Wednesday night, too, but intentionally throwing "Johnny Wholestaff," as it used to be called, in a win-or-go-home playoff game was certainly an unprecedented experiment. "I think the first two batters obviously weren't the way I drew it up. Didn't quite get ahead, got into some bad counts and they made me pay," Hendriks said. "After that, I kind of settled down a little bit. Got into a rhythm and was able to retire the next three, but unfortunately the first two came back to bite us." Judge's home run off Hendriks put the A's in a quick hole at raucous Yankee Stadium. They opened the fifth with their first hits of the night, consecutive singles that chased Severino. But then Dellin Betances retired Matt Chapman and Jed Lowrie before striking out slugger Khris Davis , the 2-3-4 hitters in the lineup, to thwart the scoring threat. "It was a tough environment," Davis said. "Their pitching just showed up tonight. They made good pitches when we had baserunners on and we've got to tip our cap." Treinen allowed Luke Voit's two-run triple and an eighth-inning homer to Giancarlo Stanton. The All-Star reliever was charged with three earned runs in two innings, the first time he yielded more than one in an outing all year. "I just didn't do a good job of executing pitches," Treinen said. "I had a hard time getting my slider down." "We couldn't get that big knock," catcher Jonathan Lucroy said. "They got us on the run early and had two innings where they put up quick numbers," Melvin said. "We just didn't do enough offensively tonight. You do have to give them credit. They pitched really well," he added. "The first run is big. When you're away and you get the crowd into it, that's more that you have to overcome."